Scalable Network-Based Security Solutions With all FortiCore models supporting 32x 10G interfaces, scalable stacks of security appliances can be programmatically attached to the network. Effective Line-Rate Performance Combining FortiCore’s hardware-accelerated switching with its Cardinal Flow Processing (CFP) technology, no sacrifices are made in supporting large programmable flow tables with line-rate performance up to 800 Gbps. 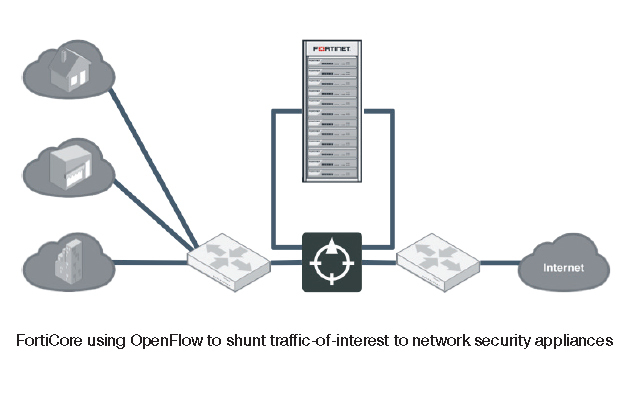 OpenFlow 1.3 Compatible Provides ease of integration in hetergenous SDN environments, with support for a wide array of SDN controllers, including OpenDaylight and ONOS. 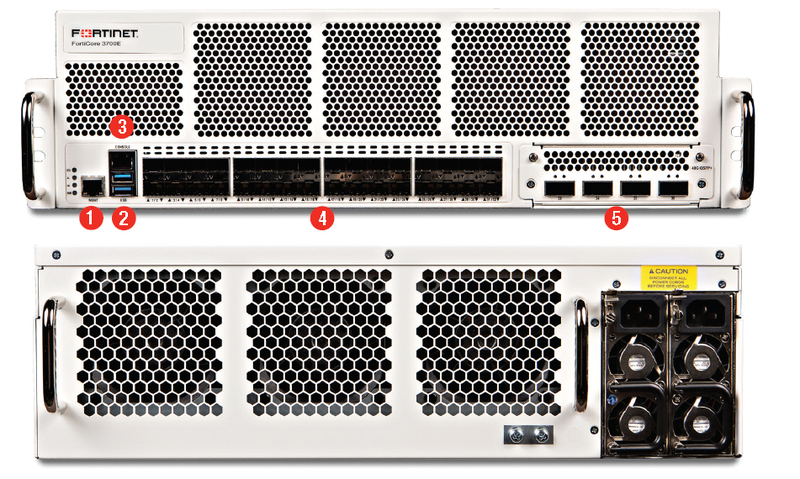 The principal goal of the FortiCore is the creation of scalable network-based security solutions that go well beyond the datasheet limits of an individual security appliance. FortiCore’s massive performance and flow capacitance allow the creation of provision-able solutions using the programmable capabilities of software-defined networking (SDN). Combined with an SDN controller and SDN applications, FortiCore solutions can be integrated into carrier/cloud programmable provisioning systems. The FortiCore deploys in a path-centric fashion, allowing you to connect an array of network security functions onto any given high-performance link within a core routed environment, including 100G links. The security devices associated with the FortiCore can be varied, based on traffic inspection requirements. Using the capabilities of SDN to program network flows onto the FortiCore, traffic-of-interest can be redirected through a variety of network security devices, while maintaining the symmetric traffic requirements of each device. 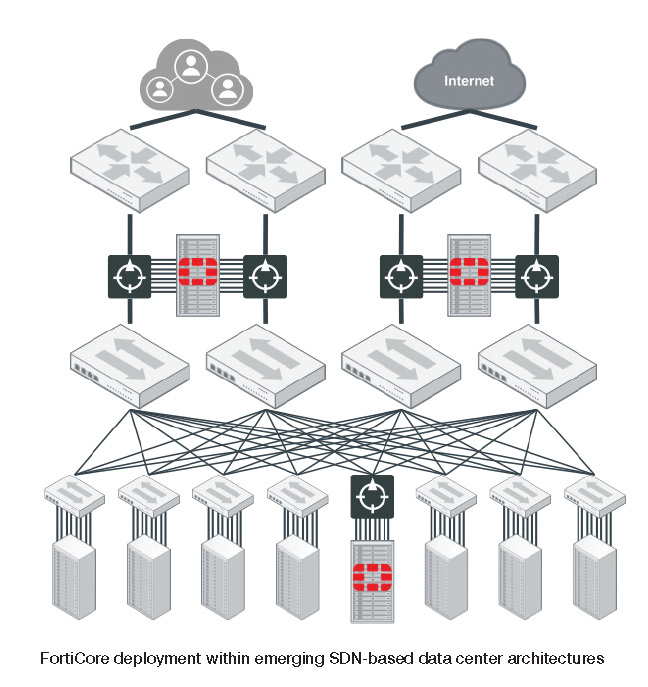 In leaf-spine data center architectures, where all leaf switches are connected to every spine switch, resulting in all hosts within a data center being one-hop from each other, the FortiCore as a security leaf allows the deployment of centralized traffic inspection to protect data center resources. FortiCore supports very high numbers of programmed flows, allowing it to operate proactively, learning all required flows, thus allowing other SDN switches to forward unknown flows to the FortiCore, rather than up to the control plane. This defends the SDN control and applications planes from DoS and other attacks from the data plane.